In today’s world of Google, Pinterest, and a slew of other social media outlets it can feel overwhelming when searching for a good recipe. If you enter “vegan _______ recipe” in any search engine you will get so many hits it becomes almost impossible to pick which one to try…or have any idea which will actually be good. Thank goodness for cookbook reviews! when I was eating at a small vegan diner in Eugene, OR called Cornbread Cafe (which is excellent, by the way). I saw the cookbook for sale on the counter near the register and decided to grab it for some entertainment while I was waiting for my food. 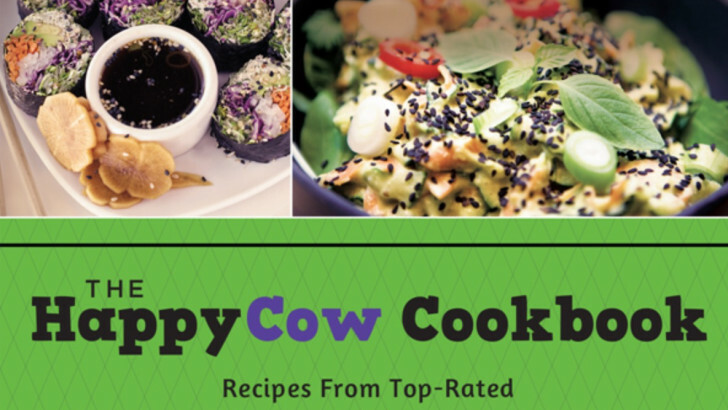 I will admit, the simplistic cover with its cartoon cow made me think it was going to be full of semi-silly recipes. Yes, I did it. I judged the book by its cover. And boy was I wrong! The cookbook, as it states on the cover, features recipes from various restaurants all around the world, including Cornbread Cafe! Over 40 different restaurants, to be exact. The recipes range from simple vegan cornbread to exotic dishes I’ve never heard of such as Moroccan Tajine and sweet desserts like Pumpkin-Chocolate Chip Bread Pudding. It also includes a brief history of each restaurant and a Q&A section with the owners which is enjoyable to read and also makes you feel more connected to the recipe you are preparing. is full of absolutely amazing recipes with brightly colored photos, causing you to start salivating before even getting to the ingredients list! I know each and every person, whether vegan, vegetarian, or neither, will find multiple recipes they truly enjoy cooking, eating, and sharing with family and friends.